STBinary is binary options broker which offer many promotions. The best promotion is their random deposit bonus up to 100%. 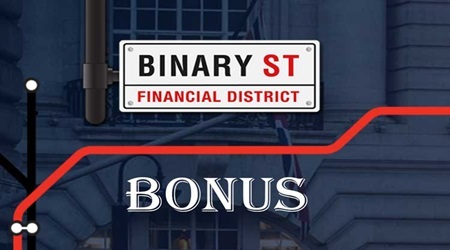 Random means that STBinary choose what to be the bonus size for the client, as the maximum bonus that could be gived is up to 100%. STBinary is binary options broker established in 2014 with headquartered in Cyprus. The broker offers several account types starting with the minimum deposit of $250. The minimum trade size must be $10, as the payouts is up to 85%. STBinary offers online trading platform, so the traders could trade without download anything. All clients received random deposit bonus. Register new account in STBinary and after that you must upload verification documents to verify your account details. After verification process you must deposit at least $250 and after that you should request the bonus. Bonus on your deposits will be up to 100% bonus, as the percentage is decided by StBinary support. This offer is valid for both all new clients and old clients, as the deposit bonus is only valid for verified accounts. If traders want to withdraw all their profits, they must trade $30 for each $1 Bonus. For example, if your bonus is $150, you should trade at least $4500 to withdraw all your profits. The promotion can be changed or terminated at any time without previous notice by STBinary. personely i would not recomand this broker . so you cannot withdraw your money . in the mean time they hope you will lose your money . so you wright against the wall .